Full project descriptions and contact information for each project are online at www.aiatopten.org/hpb/, or as part of BuildingGreen Suite at www.buildinggreen.com/hpb/. Designed as a meeting place and support center to help people transition out of homelessness, this 26,800 ft2 (2,490 m2) building includes a computer room, an art studio, a clinic, and offices for community-support agencies, along with 100 beds. 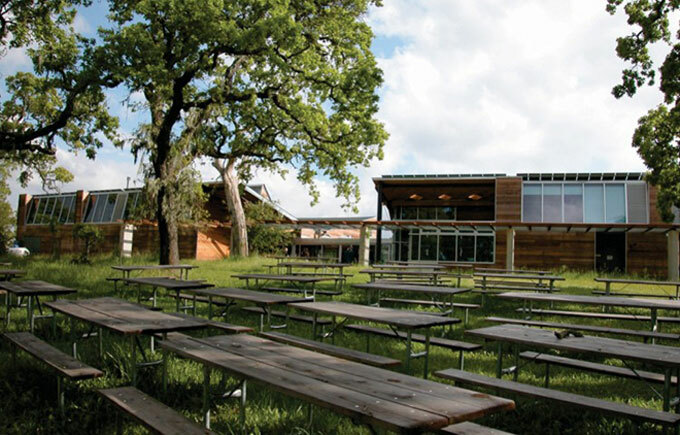 Sited on a former brownfield in downtown Austin, the building includes a 13,000-gallon (50,000-liter) rainwater collection system and a solar hot-water system to preheat water. Flyash was used to replace 45% of the portland cement in the concrete. Daylighting and views are provided in more than 90% of the workspaces. 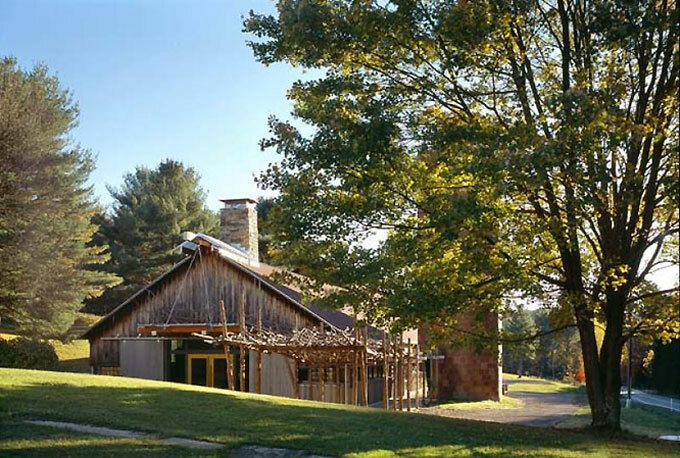 The Barn at Fallingwater is a 13,000 ft2 (1,210 m2) adaptive reuse of a 19th century heavy-timber barn and its 20th century dimension-lumber addition. It serves as an interpretive portal for the Western Pennsylvania Conservancy’s 5,000-acre (2,000-ha) Bear Run nature reserve, immediately adjacent to Frank Lloyd Wright’s Fallingwater. The reuse of graywater and treated blackwater reduces potable water use. A ground-source heat-pump system and daylighting minimize energy use. All plantings are native, and runoff from an existing parking lot is filtered through bioswales. A large bat house was built for the colony of bats displaced by renovation of the upper barn. 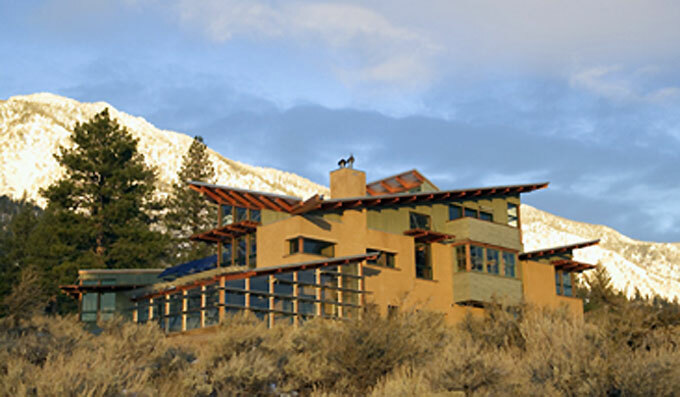 This 3,450 ft2 (321 m2) home on the eastern slope of the Sierra Nevada Mountains uses shading, high insulation values, thermal mass, and flushing with cool night air to prevent overheating. Solar hot-water panels feed a deep-sand-bed hydronic heating system and provide domestic hot water. A grid-intertied photovoltaic system meets the home’s electricity needs. The garage and guest wing blend into the landscape via sod roofs. Primarily strawbale, the home also features structural insulated panels, insulated concrete forms, FSC-certified wood, and an impressive collection of salvaged materials. Wildlife habitat is irrigated with graywater. 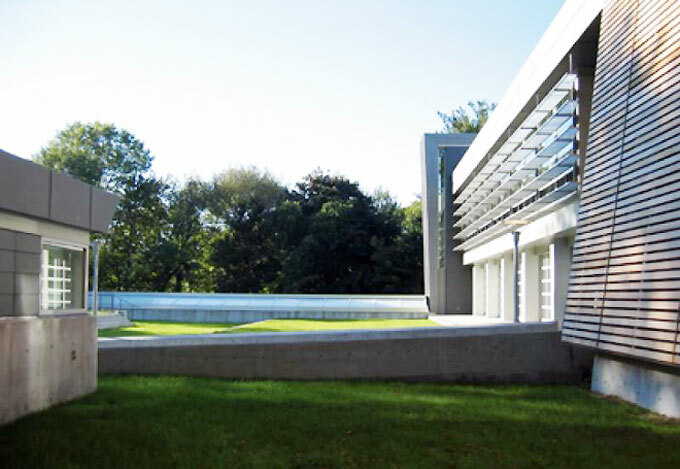 The LEED® Certified 60,000 ft2 (5,570 m2) Monika A. and Charles A. Heimbold Visual Arts Center at Sarah Lawrence College is integrated into the topography of its site, with photography labs and other studios that do not lend themselves to daylighting located underground. A green roof reduces stormwater runoff. Native plants and low-flow fixtures reduce water use. A ground-source heat-pump system heats and cools the building. Indoor environmental quality is improved through daylighting and operable windows. Materials were selected to protect indoor air quality and to lessen the environmental impacts of their manufacture. Stanford University’s 13,200 ft2 (1,230 m2) Sun Field Station is located within the Jasper Ridge Biological Preserve, in the foothills of the Santa Cruz Mountains. Waterfree urinals and dual-flush toilets reduce indoor water use, and native landscaping is irrigated with collected rainwater to minimize potable water use. Passive-cooling and solar-heating systems, combined with good insulation and extensive daylighting, minimize energy use. The building was designed to be carbon-neutral with a 22-kilowatt, grid-connected photovoltaic system meeting much of the energy load. Salvaged, reused, recycled, and low-VOC materials were used when possible. All lumber was FSC-certified. The project team diverted 95% of the construction waste from the landfill. 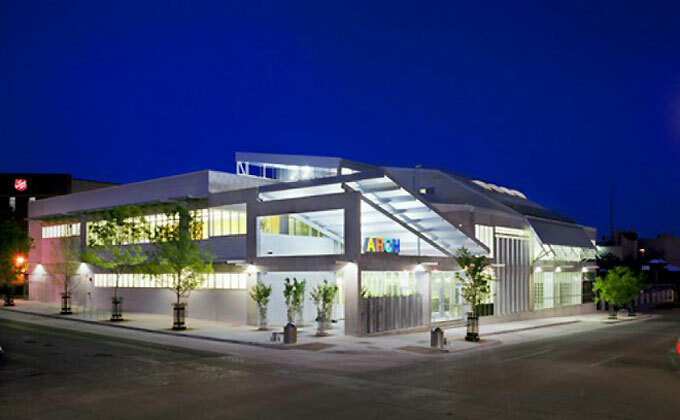 The 17,600 ft2 (1,630 m2) Pittsburgh Glass Center is a building reuse and neighborhood-revitalization project. 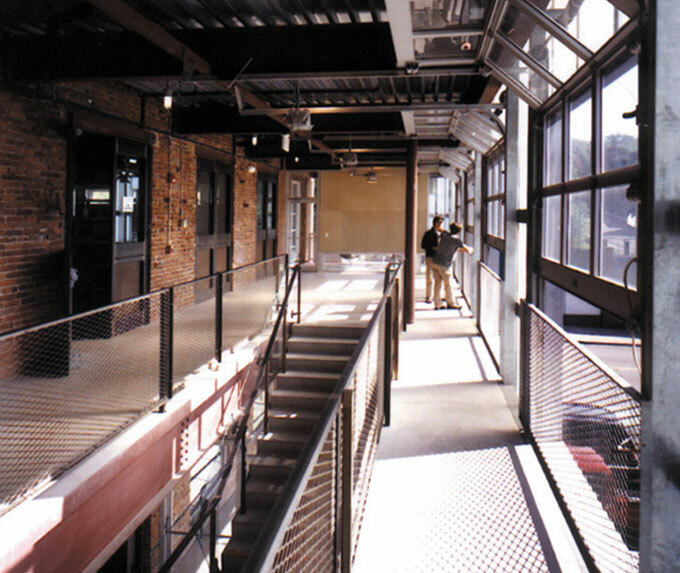 Alterations to the building shell increased daylighting, views, and natural ventilation. Heat from the glassmaking equipment is recovered, and the thermal mass of concrete floors and ceilings moderates temperature swings. The parking lot is surfaced with crushed limestone and landscaped with indigenous plants. About 14% of the building materials, by cost, were salvaged from the original building and other sources, and all new materials were evaluated for recycled content and local manufacturing. 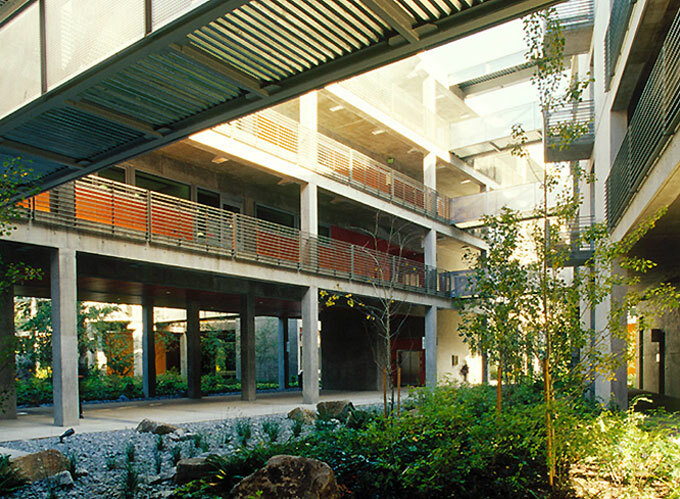 Rinker Hall serves the students of the University of Florida’s College of Design and Construction. The three-story, 47,300 ft2 (4,390 m2) building includes classrooms, teaching labs, construction labs, faculty and administrative offices, and student facilities. The LEED Gold building is oriented on a pure north-south axis, demonstrating the ability to utilize low-angle light for daylighting. Materials were reviewed for proximity of manufacture, recycled content, renewable-resource content, sustainable harvesting, longevity, low maintenance requirements, low toxicity, and the ability to be recycled or reused at the end of their useful lives. This 168,000 ft2 (15,600 m2) academic facility includes five semi-independent buildings, each including faculty offices, student homerooms, seminar rooms, breakout spaces, a workshop space, and a lecture hall. 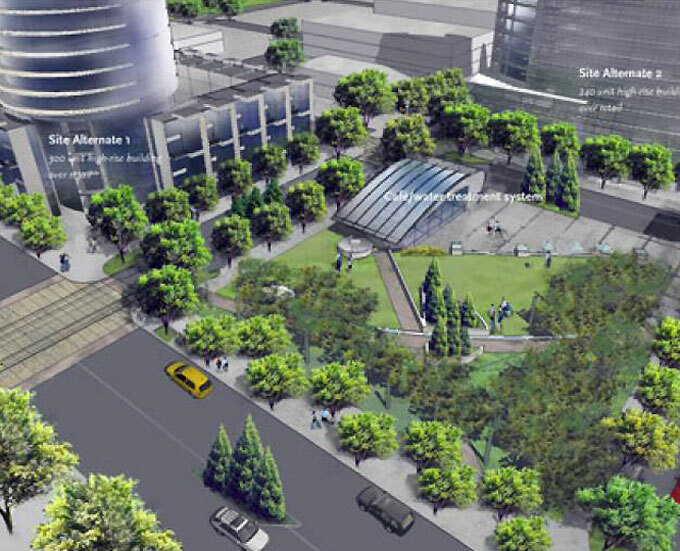 A green roof covers half of the footprint area, and native plantings are featured in the landscaping. Waterfree urinals contribute to a potable water savings of 25%. Exterior sunshades, operable windows, nighttime flushing, and exposed thermal mass allow 80% of the design to be naturally ventilated. The building is 31% more efficient than a similarly naturally ventilated base building. 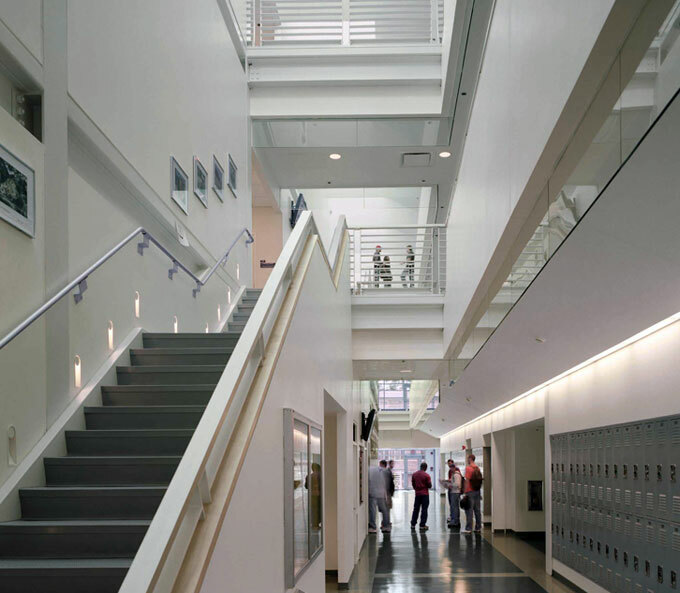 Daylighting is provided to all occupied spaces. The Lloyd Crossing Sustainable Urban Design Plan creates a new identity for a 35-block, inner-city neighborhood through a 45-year plan. Habitat quantity, quality, and connections will be improved by restoring “patches” within the streetscape that connect to existing habitat corridors. An integrated water system will include stormwater management and treatment, and graywater and blackwater treatment and reuse. Energy demand will be reduced and onsite renewable-energy resources, such as biogas, solar, and wind power, will be harnessed. Carbon neutrality will be achieved through the purchase of carbon credits.